The Grand Junction Police Department needs your help to identify a male suspect that is wanted for harassment. 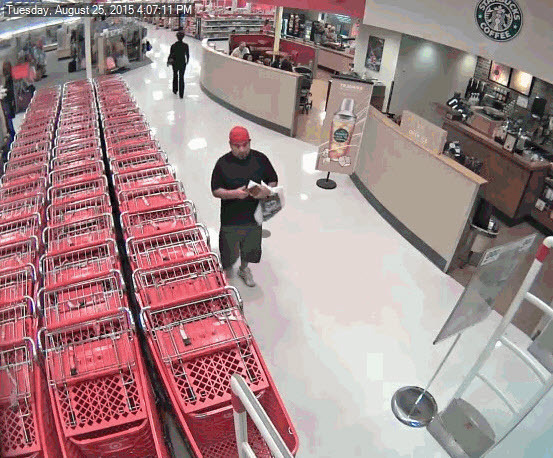 On Tuesday, August 25th two female teenagers were shopping inside Target located at 2424 Hwy 6 & 50, when they noticed a male subject taking photos of them. The suspect was described as Hispanic male, approximately 40 years old, 5’3” tall, with a scruffy mustache and goatee wearing a black t-shirt, shorts, and a red baseball cap. The surveillance photo of the suspect can be viewed at http://www.241STOP.com. If you know the identity or location of the subject involved in this crime, please contact Crime Stoppers at 241-7867. Information reported to Crime Stoppers that leads to an arrest can earn you up to $1,000 cash reward and you will remain completely anonymous. For more information, see us at http://www.241stop.com. This entry was posted in Crime of the Week, GJPD News, The Insider on The GJPD Patrol and tagged GVCopBeat, MCCrime Stoppers, ShareGJ, Suspect, Target.